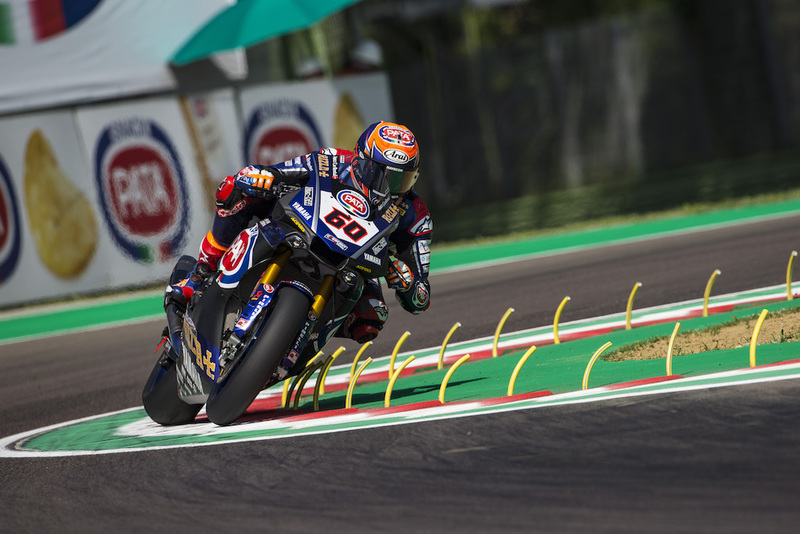 The Pata Yamaha Official WorldSBK Team and Michael van der Mark enjoyed a positive start on Friday at a hot and humid Imola, Round 5 of the 2018 FIM Motul Superbike Championship. Michael van der Mark displayed good pace throughout the day and finished fifth fastest on the combined timesheets with a 1:47.461 to make it through automatically to Saturday’s SP2. The Autodromo Internazionale Enzo e Dino Ferrari has always been the toughest track for the Yamaha YZF-R1 since the manufacturer’s return to the WorldSBK Championship in 2016 but on Friday they went some way to banishing this and showcasing the progress the Pata Yamaha team have made. Van der Mark arrived in Imola off the back of a double podium in Assen and riding the crest of a wave of confidence. The 25-year-old Dutch rider set out his stall in FP1 by ending the morning in sixth place with a 1:48.232. In FP2 he focused on finding a good feeling with his Pata Yamaha R1 around the demanding rollercoaster of a circuit and while he didn’t manage to improve his time, the work put in would come to fruition in FP3. Sitting in tenth with just five minutes to go in the final session of the day and on the cusp of having to go through to SP1, the 2014 WorldSSP Champion put in some fresh tyres and managed to set a 1:47.461 – his fastest ever lap around Imola – to end Friday in 5th overall. This means van der Mark progresses automatically to SP2, although he knows there is still work to do in Saturday morning’s FP4 session to improve the stability of his bike if he is to repeat his podium heroics from the last round. The Pata Yamaha Official WorldSBK Team return to action on Saturday at 8:45 am local time (CEST) for FP4, with qualifying starting at 10:30 am and the 19-lap Race 1 scheduled for 1 pm. Click here for the combined results from Friday’s Free Practice.